Well, since we're coming up on the end of my first full week of blogging, I thought I'd steal somebody else's idea again. 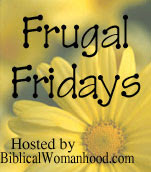 I give full credit to Crystal of BiblicalWomanhood for the Frugal Friday idea. By the way, check out her blog. It's full of information! Well, onto my first of two posts for Frugal Friday. This is what I purchased at CVS yesterday. So what? So...I only paid $3.61 for all of it and got $5 off of my next purchase there. Yay for me! Now shopping at CVS and getting these great deals are not for the faint of heart. (in my opinion) It's taken some time and research, but look what I have to show for it! Yes, that is a blood glucose measuring device and, no, I don't have diabetes. But my mom does. And I used to. So, it can't hurt to check it every now and then, can it? Besides, I got it for free! How? you may ask. Be sure to check out this link for very detailed instructions. It's how I got my start! I'm afraid that our family is not as frugal as Crystal when it comes to grocery shopping. She feeds her family of 4 for $35 a week! While I would love to attempt that, it is not a priority for my husband. We tend to tighten our budget in other areas because of our priority of eating organic/primarily grassfed meats. So, our meat cost alone this week was double Crystal's weekly budget, but I figure that I can save LOTS of money on our toiletries by shopping at CVS. Onto my second post! Since our produce/meat/grocery budget tends to be much more expensive than most people's due to our insistence on organic/grassfed, I try to be frugal in other areas. I also believe strongly in preventive maintenance when it comes to our health. This is one reason I have ALWAYS made my children's baby food. Our oldest ate baby food for 18 months, so, yes, it was time consuming. Our daughter was on table foods by 12 months. I thought I had it down. "All of our future children will be on table food by 12 months," I proclaimed. Then we had GB. GB has been a challenge almost from the beginning. He's had several health issues, and, since starting him on solids, several allergy issues. So I thought I'd demonstrate making baby food for a 14-month old. Hopefully, none of you will need to make it for that long! Foods I started out with. Cut into 1/2" to 1" chunks. I did not use all that I had, but a portion of each food. This is partially blended. I add liquid to start off (broth, water, etc.). If it doesn't blend fully after a reasonable period of time and scraping down the sides, add more liquid. Final product. Warning: not for the weak of stomach! GB didn't seem to mind though! He loves his food! Stay tuned for my Ron Paul article! Thank you sooooo much for sharing that!!! I am so glad I stumbled here from Crystal's site. I made all our babyfood also, but nothing so elaborate. I started my little one on non blended as soon as he could handle any given thing. I mashed up the potatoes and other similar things, but I never blended into one meal like that. Last night my 11 month old ate small pieces of meatloaf off my plate... and off my fork as a matter of fact. We were at someones home for dinner. He ate (from my fork again) the colliflower, meatloaf, and sweet potatoes. I'm getting ready to have another though... and I'm excited to use some of what I have learned here to make my life easier! Glad I could be of help! :-) I've added some more directions (since somebody actually read my post!). It actually can be quite easy if your children can eat what you eat. You simply take a portion of what you're eating, put it in the blender, add some liquid and, about 1 minute later, you're ready for business. Our problem with GB is that he cannot eat the majority of what we eat. So, I have to make separate food. Oh, well! We're happy with the blessing that God's given us! I have a little mini food processor I got for free at Kohls a few years ago (some "buy this, get that free" type deal) and I loved it for making Hannah's baby food. It is nice and portable too. Great homemade baby food. I make my own too. And, CVS deals are terrific aren't they?! Lady Why, thanks for your comments. I'm so grateful to Crystal for the CVS 101! I enjoy your blog as well!